Ok, I’m back to eating a pound of bread a day, after taking a variety break yesterday. So far, in the first 9 days of the bread challenge, I’ve eaten 4.11 kg of bread (in addition to everything else I’ve eaten), averaging 457 g/day (1.01 lbs/day). I weighed in at 80.3 kg this morning, close to my low point, and more-or-less making weightloss progress. So, I’m not panicking that “bread makes you fat”, and I’m going with reason on this one: they’re just calories. 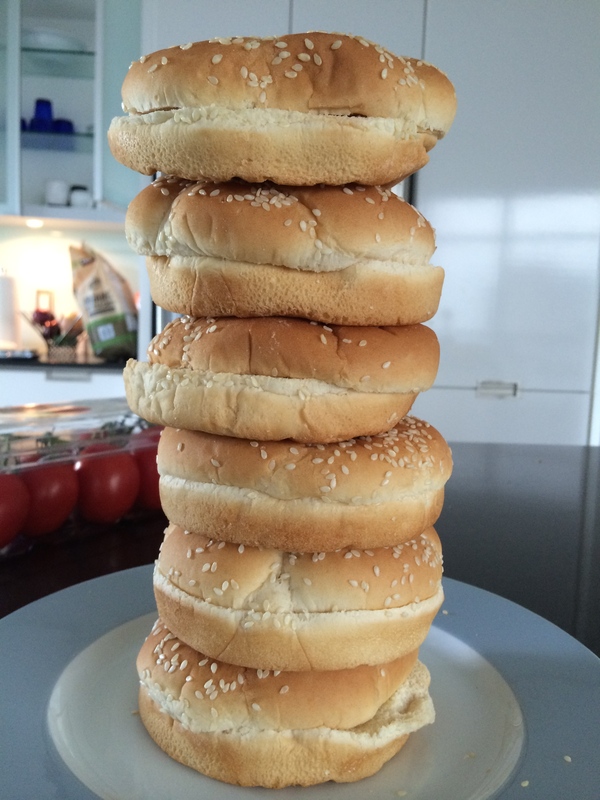 I wanted to eat some salmon burgers today, so I went with the Wheat Belly stack of 6 hamburger buns, totaling 450g for the day. Dr. Davis uses this picture to imply that “bread makes you fat”. Does everyone accept this because they envision eating it all at once? Sure, that’s how a lot of us eat. But me, I’m going to spread them out over the day. And I’ll probably get a workout in tonight.